How do I apply to the Maine Media College MFA program? Semesters begin during semi-annual retreats held in early November and May. Applications are accepted for consideration at any time, however the deadline for application submissions for fall retreat admissions is September 30 and for spring retreat admissions the deadline is April 15. Admissions materials are reviewed by the core MFA faculty and acceptance decisions are made prior to retreats. Applicants are notified of admissions decisions within three weeks of receipt of completed applications. What kind of work should I include with my application? The MFA is a Fine Art degree. The faculty would like to see recent work (done within the last two years) that is competent technically, is representative of your creative focus, and makes a coherent artistic statement. It is generally not a good idea to submit work done commercially over which you did not have exclusive creative control. Additionally, it is not recommended that you send work with the intention of demonstrating your versatility; send work that most identifies your own interests, personal work. May I work on my projects with any mentor I choose? You may work with a mentor of your choosing on studio projects provided the College approves them in advance. They must submit a CV for review. The school prefers that they hold a terminal degree, however, if they can demonstrate substantial professional experience, this qualification may be waived. Further, if they have particular expertise in an area you intend to pursue with a specific project, they may be qualified to work with you on that project, regardless of the degrees they do or do not hold. You may work with any of the MFA faculty or Maine Media Workshops instructors who have previously been qualified to serve in this capacity without having them submit a CV. Members of the MFA faculty mentor all academic projects. Is Maine Media College accredited? Maine Media College has been authorized by the State of Maine to confer the Masters of Fine Arts degree. NECHE’s Commission on Institutions of Higher Education has determined that Maine Media College is eligible to proceed with an application for candidacy for accreditation within two years. A determination of eligibility is not candidacy or accreditation, nor does it indicate a likelihood of eventual accreditation. Questions about eligibility and the accreditation process should be directed to the Director of the Commission. Costs for tuition and fees related to intensives and retreats total approximately $32,500. Room and board costs for retreats and intensives total approximately $4,200. Should you elect to take workshops in fulfillment of to 60 credit degree requirement costs will vary accordingly. More information on cost is available on the Tuition & Fees page. Does Maine Media College offer financial aid? Students may apply for small loans from Maine Media College. All loan information is on our Financial Aid page. There are also several scholarships for which college students may apply. Please see our Scholarships page for more information. Can I get a Federal loan to pay for my MFA degree at Maine Media College? Not at this time. To qualify for such loans, the school a student attends must be accredited by an organization recognized by the government. Can I use my Veteran’s benefits to pay for my MFA degree at Maine Media College? Yes. Maine Media College has been approved by the Veteran’s Administration under the Post 911 Bill. How much time must I spend on campus? You must currently attend, at minimum, seven semi-annual retreats. Retreats run from Tuesday evening through Sunday brunch. In addition to retreats, you must also complete four, one-week (Monday through Friday) Intensives during the course of your tenure in the program. I work a full-time job. How much time will I be required to devote to the program? Students should expect to devote at minimum 21 clock hours per week to their studies over the course of a 10-credit semester. Must I have previously earned an undergraduate degree in the field I intend to pursue in the MFA program? Students come to the program from diverse educational backgrounds and degrees. An undergraduate degree in some field is generally required. In extraordinary circumstances the MFA Committee may admit an applicant who does not hold an undergraduate degree. In these instances, the applicant must provide persuasive and ample documented evidence of an education equivalent in breadth and depth. If I have completed a workshop at Maine Media prior to matriculation into the MFA program, will I receive graduate credit? You must be enrolled in the program to be eligible to receive credit for workshops. While you may earn up to nine credits for completing approved (levels 3 and 4) workshops (one credit per workshop), your advisor must also approve, in advance, any and all workshops you intend to take. You must also present work you completed during a workshop for critique at a subsequent retreat to earn credit. A list of workshops currently approved for graduate credit may be found on our Resources page. May I transfer credits from another institution? Maine Media College does not accept credits from other MFA programs nor does it award credit for professional experience. The MFA Committee views the program holistically, as a process, rather than as an amalgamation of academic credits. The Committee recognizes professional experience in making admissions decisions. 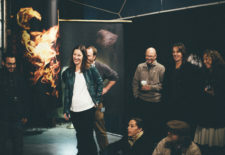 Candidates may take courses for credit at other graduate institutions while enrolled at Maine Media College MFA upon prior approval of the MFA Committee. The Committee grants no credit for courses of a technical nature. Moreover, the Committee favors mentored learning and individualized courses of study. It is therefore disinclined to endorse surveys or other generalized courses unless it deems such courses most appropriate in individual cases. Candidates taking courses at other institutions must pay half the regular tuition costs of credits to Maine Media College.